It’s no secret that Autism is on the rise, but what's being done about it? Researchers have invested a lot of time and money to figure out ways to reach kids with Autism Spectrum Disorders, and a few have come up with an approach called "Virtual Reality." Virtual reality is a realistic simulation of an environment by a computer system. It’s technology taking you to a scene that feels and looks real, and for some kids with Aspergers (high functioning autism), it can be a safe way to learn to interact with others. Virtual reality allows Aspergers kids to practice all-important reciprocal social interaction skills in a safe environment. Virtual characters are more predictable than real peers, and sometimes more patient, and so Aspies may find it easier to engage in the kinds of interactions that we ultimately hope they will have in the real world with their real friends. In a “virtual reality” environment, the user experiences “immersion” (i.e., the feeling of being inside and a part of that world). The Aspergers child is also able to interact with his environment in meaningful ways. The combination of a sense of “immersion” and “interactivity” is called “telepresence,” which is the extent to which one feels present in the mediated environment, rather than in the immediate physical environment (i.e., an effective virtual reality experience causes you to become unaware of your real surroundings and focus on your existence inside the virtual environment). The “Virtual Reality” project started over ten years ago with a study designed to determine whether virtual reality could help Aspergers kids learn the beginning skills of street crossing. These kids were placed in a virtual world and practiced correctly observing and responding to the virtual world situations. The results indicated that they could - and did - accept learning in a virtual world. Here’s how it works: There are two modes of interaction in virtual learning systems. 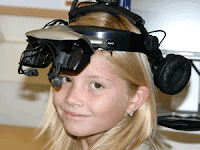 In one, the youngster interacts directly with a virtual peer. In another, the virtual peer is controlled by the youngster. In the future, it is hoped that virtual reality can go even further in helping kids with Aspergers and Autism. Virtual peers of this sort can help to assess the exact nature of the social deficits that may be experienced by these kids, which in turn may allow us to design better and more targeted interventions. A playmate named Sam, a talking dog named Buddy, and an Israeli street leading to a toy store all have starring roles in a new generation of virtual reality games designed to teach basic safety and social skills to kids diagnosed with Aspergers and Autism. Skills that are often taken for granted can be torturously difficult or school-aged Aspies (e.g., classroom manners, navigating the social norms of group playtime, etc. ), but with a virtual reality learning experience, “practicing” for multiple real-life situations that occur in the real-world is finally possible. This all sounds relly interesting. Do you have details of what packages are available to purchase and whether they are available in UK as well as the USA? Would this be the sort of material my son has been accessing on his Nintendo e.g Petz and on Facebook Farming ? If so then all of these virtual games have a real place in my son's life! When would this technology be available in Australia....it sounds good, but also sounds like a 'down the track' option.